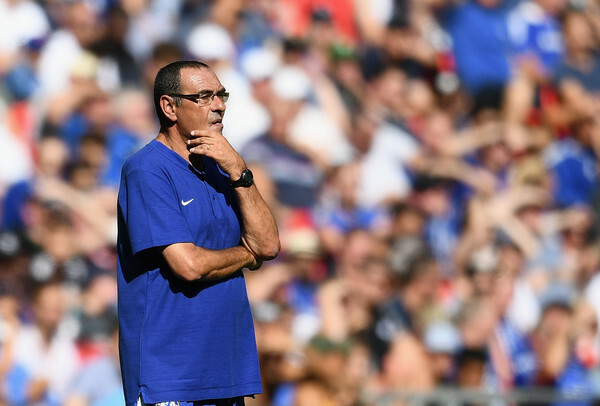 After Chelsea's last preseason friendly against Lyon last night at Stamford Bridge, Maurizio Sarri has said it will take two or three months for the team to reach their potential. The former Napoli boss is just about a month into his Chelsea contract, with a new philosophy and training for the first time this week with a full squad. "I am very happy I can work with all my players for the first time tomorrow [Wednesday]," said Sarri after the Blues' penalty shootout win over Lyon. "Potentially we can become, in two or three months, a very good team." Chelsea will play their opening Premier League match away at Huddersfield on Saturday. When asked if the match came too early, Sarri replied: "Yes I think so, especially for all of them." Sarri started the Lyon game with a second string side despite it including some of his World Cup stars like Nigeria's Victor Moses, Brazil star Willian and Rube Loftus-cheek of England. Belgium star Eden Hazard, France duo of Ngolo Kante and Olivier Giroud all came on as a second-half substitute in a game that ended 0-0. Chelsea won the Lyon friendly on penalties with new signing Robert Green been the hero of the match. Sarri will be training on Wednesday with a full squad for the first time and he is delighted to have his top players back. Chelsea are also set to announce the signing of a new goalkeeper Kepa Arrizabalaga from Spanish side Athletic Bilbao.